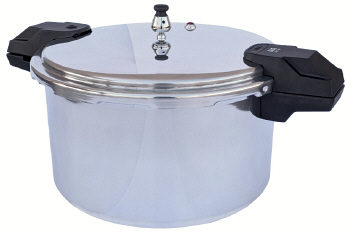 Pressure cookers for canning and home food preservation. 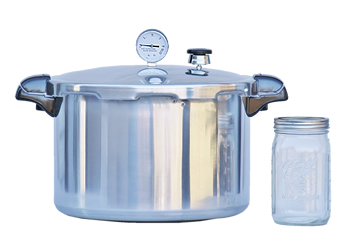 Canning pressure cookers are different from pressure cookers. 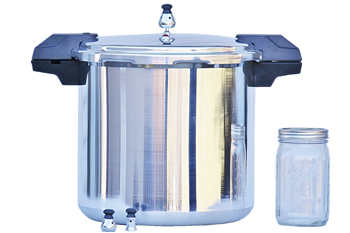 (1) They are large for canning jars and (2) their size achieves stable processing times, temperatures and pressures that meet home food preservation standards. Lower your food bill and feed your family. 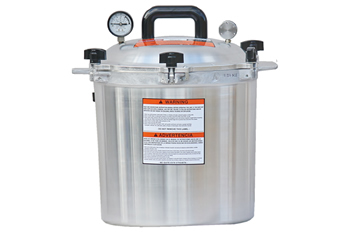 We offer the biggest variety of Pressure Canner Brands and sizes to choose from. Gasket or metal to metal seal? Big or Small Pressure Canner? 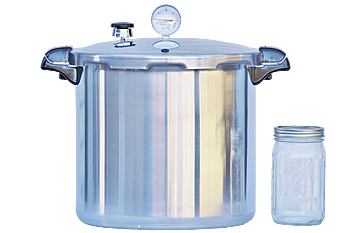 If home canning is to be done regularly, it pays to have a good-sized pressure canner in perfect working order. The four top row pressure canners are by Presto and Mirro. These seal using a rubber gasket. 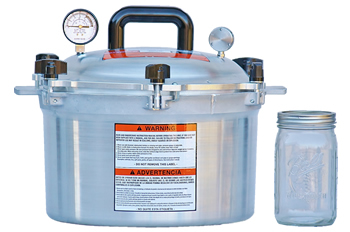 Our line of Presto and Mirro pressure canners are great for home canning or cooking large quantities of food quickly. We also offer Pressure Canners from Wisconsin Aluminum Foundry, more commonly known as, the All American Pressure Canners. The remaining rows of canners are All American Pressure Canners, made in the USA that use a metal to metal seal. All American Canners hold steam in under pressure without a gasket. The advantage? Simply no worries about keeping your gasket in perfect working condition. 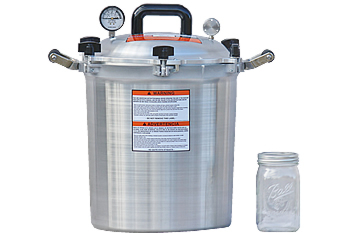 The size of your pressure canner should be suitable to the kind of jars you would like to use and the probable number to be handled at one time. 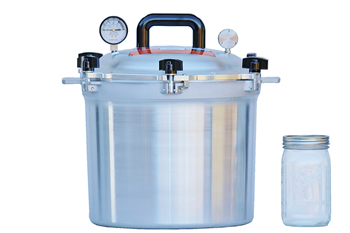 For home use, pressure canners from 16-to 23- quart capacity have been found most satisfactory. While large pressure canners are available, they are often too heavy and too awkward to handle. 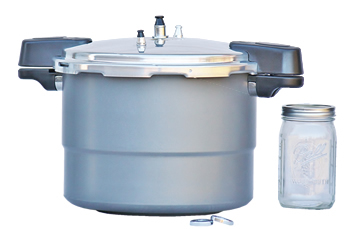 Smaller pressure cookers (below a 12- Quart capacity) are intended for cooking rather than canning. They only fit a small number of jars, and it's almost impossible to operate them so that the pressure does not fluctuate during the processing period. 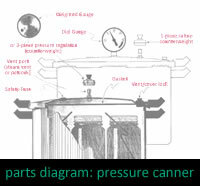 A pressure canner is required for processing meats, practically all vegetables except tomatoes, and other non acid foods. 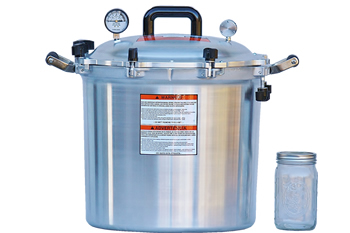 The pressure canner is specifically designed to obtain temperatures higher than can be reached with a boiling water or water bath canner. Most importantly: check jars, lids and bands. Examine them carefully to make sure there are no nicks, chips, cracks or sharp edges. Recycle imperfect jars. Use new flat metal lids each time. Wash jars and rings in hot soapy water and rinse with hot water. 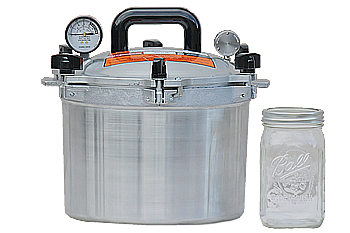 It is not necessary to sterilize jars for pressure canning. Most foods may be packed raw in jars. Raw food should be packed tightly because it shrinks during processing. Food may be also preheated or partially cooked and packed hot in jars. Hot food should be packed fairly loosely. Allow headspace between food and jar closure for a good seal. Release trapped air bubbles by using a bubble remover spatula down the sides of the jar. Wipe rim of jars free from seeds, pulp, liquid, etc. 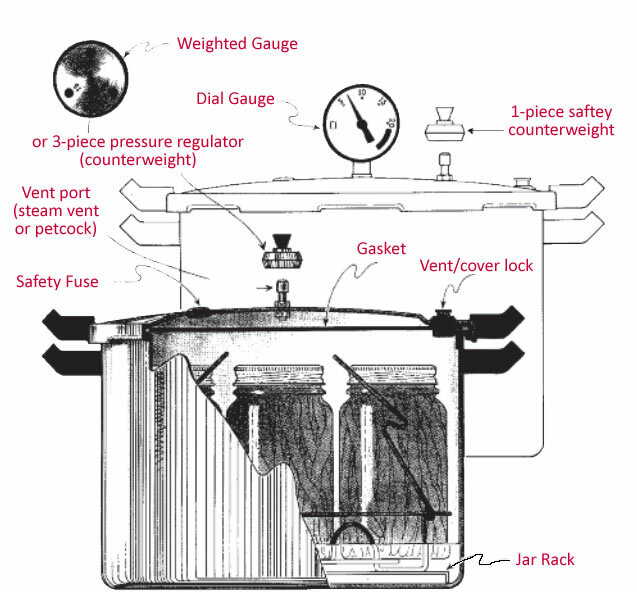 Secure lids and process according to canner manufacturer instructions and recipe. Place jars on rack in a canner containing 1 to 2 inches of water. Leave ample space between jars to permit free circulation of steam. When processing time is completed, turn off heat. Allow pressure to reduce normally. It takes about 25 minutes for the pressure to drop in a pan filled with jars. Once pressure has dropped, remove the regulator weight / control value and the cover (tilt the far side up so the steam escapes away from you). Lift jars out and sit on several thickness of cloth (never a cold surface). Do not tighten screw bands. After 12 hours, remove the screw bands. Examine the jars for leaks. To test two-piece metal lids, tap them with a teaspoon. A clear ring is a sign of a good seal. If a jar leaks, use contents at once or reprocess with a new lid or jar. 1. Be sure all fruits and vegetables are garden fresh and free from decay. 2. Corn, peas and beans expand during processing period. Pack loosely. 3. When adding liquid to fill jar, keep water level 1/2" below the top. When adding syrup, fill to within 1 1/2" of top. 4. Do not lift jars by lids when removing them from canner. This may destroy seal and allow air to enter the jar. 5. Never turn jars upside down to cool and do not stack jars or store until cooled. Mirro pressure canners no longer include canning racks. 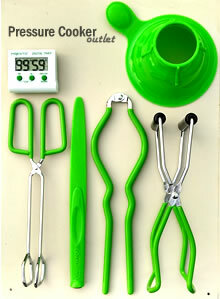 You can easily purchase one by measuring the inside diameter of your pot and selecting a rack that will lay flat inside. The space left around a canning rack in your pot doesn't matter. The rack should be big enough to be functional in your pressure canner and small enough to fit inside the pressure canner with enough space to allow the rack to expand when heated. 1/2" - 1" space around the pressure canner rack is a reasonable target for sizing.